Visit MindPlace online at MindPlace.com for light, sound systems and other tools for personal growth. 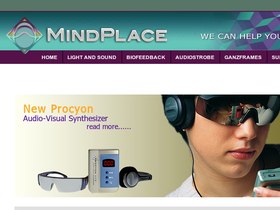 MindPlace carries Light and Sound, Biofeedback, AudioStrobe and Ganzframes. MindPlace has been in business with over 350,000 happy customers since 1988. MindPlace offers tools and products to discover different states of consciousness and attain a higher level of tranquility. Save on your next purchase from MindPlace.com with MindPlace discounts, MindPlace coupons, MindPlace promotions and MindPlace savings from 58coupons.com. Check out the variety of AudioStrobe CD's from MindPlace.com for as low as $14. Click link for titles. Head on over to MindPlace and pick up these sunglass style Ganzframes with flexible rubber earpieces for only $50. Right now MindPlace is offering their Bioeedback ThoughtStream System for only $79. Click link to view. Check out the Sirius System from MindPlace.com for only $99. This is the best Light and Sound system on the market. Click link for details.